This new look is everywhere. 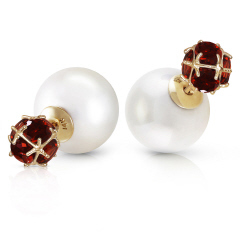 The six Garnets stones sits in front like a stud, while the larger 16mm shell pearl secures to the 14kt gold post and drops behind the lobe. Post, 14kt gold earrings. Our shell pearls are lab-created from oyster shells to ensure durability and affordability.